Use the form below to inquire about Luxury Resort And Spa In Udaipur . Use the form below to reserve for Luxury Resort And Spa In Udaipur . Surrender your soul to the hospitality at the Luxury Resort And Spa In Udaipur while the lush surroundings take your breath away. The capital of the Mewar Kingdom, Udaipur is a timeless city. Artificial lakes, lavish palaces and havelis, manicured gardens, serene courtyards, fantastical temples, and many other historic monuments and attractions in the city attract tourists from all over the world. Travelers from far and wide come to Udaipur to experience its nuances and travel back in time. The city, with its structures on one side and rolling valleys of the Aravali Hills on the other, is an epitome of romance and grandeur. Adding to the natural charms of the city are the countless narrow streets bustling with life and color. 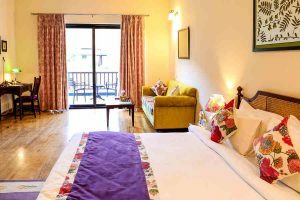 Away from the bustle, nestled in the rolling hills of the lush countryside of the city is the Luxury Resort And Spa In Udaipur, a resort that promises to pamper you silly. 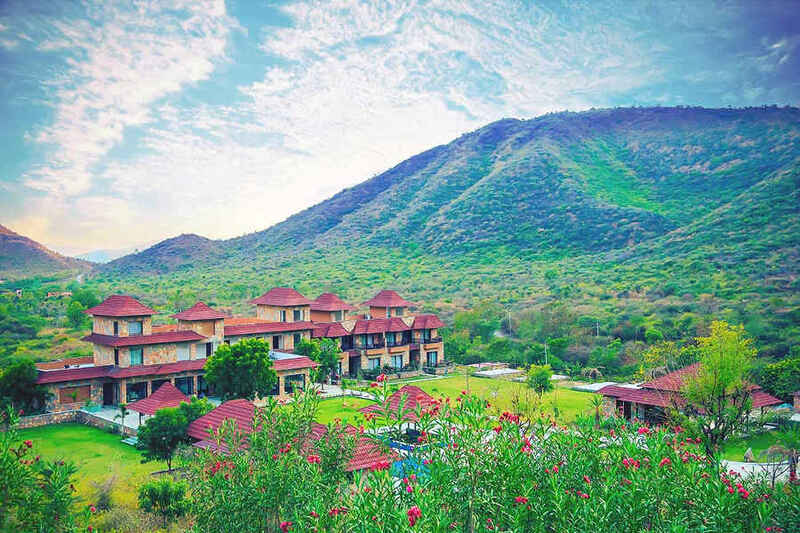 The Luxury Resort And Spa In Udaipur is a serene getaway surrounded by the verdant Aravali Hills that add to the greenery in the resort itself. 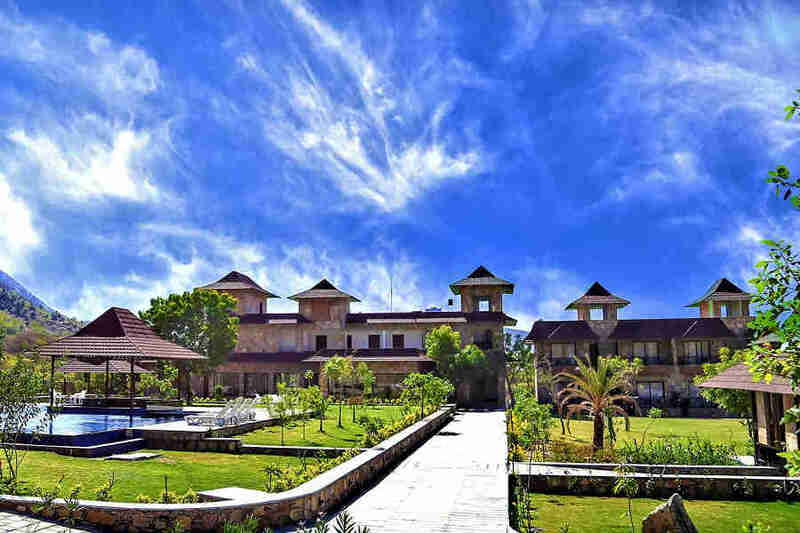 Located on a sprawling 4-acre land, the resort promises an expanse of serenity and uninterrupted time with nature. 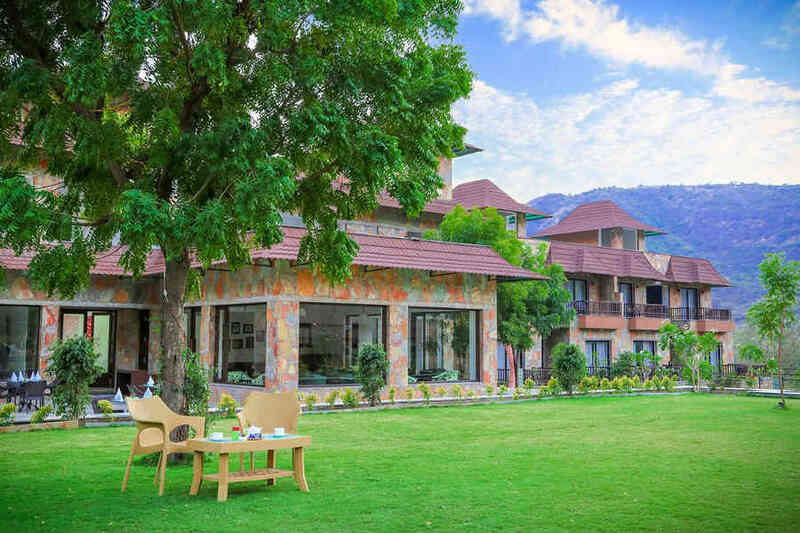 The impeccable architecture of the living spaces in the property features sloping red-tiled roofs that create a natural contrast with the greenery all around. There are green lawns, a pool, and a spa that offer a rejuvenating treat for your mind, body, and soul. 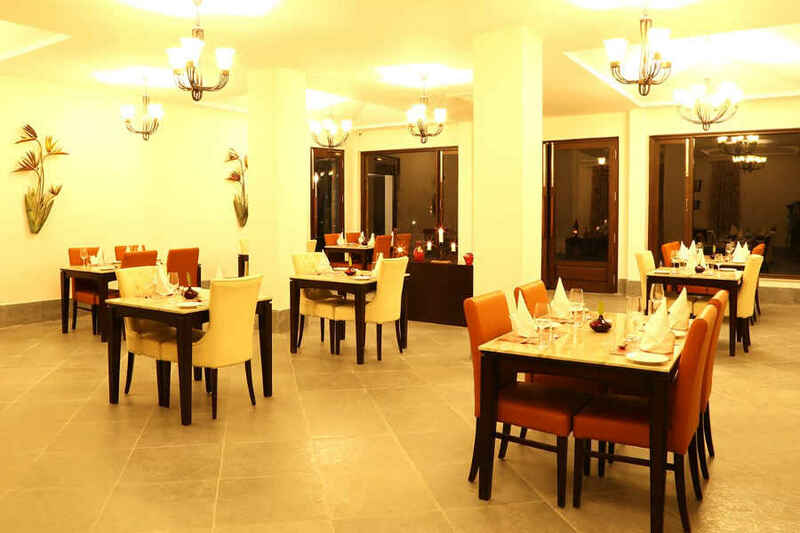 The resort’s in-house restaurant serves a variety of cuisines, including Continental and Indian. The traditional Rajasthani dishes called dal baati churma (veg) and lal maas (non-veg) are a must-try when you spend your holidays here. The resort also has a library bar and a pool bar, both of which serve cocktails, mocktails, and snacks to suit your taste buds. 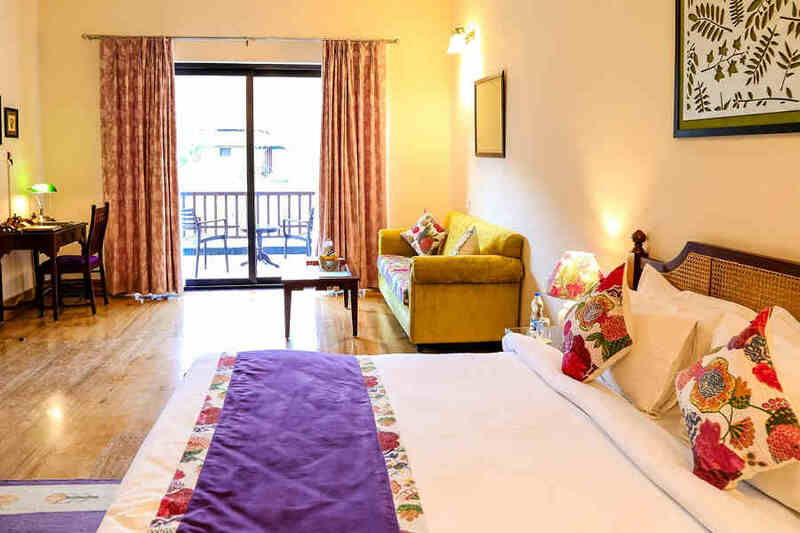 The Luxury Resort and Spa in Udaipur ensures that the accommodation it offers its guests is a thing of luxury. There are 16 rooms, including Superior Hideaway Rooms and Standard Hideaway Rooms, at the resort. 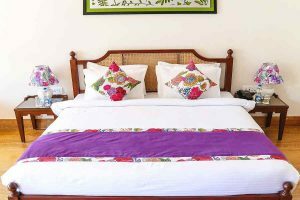 The Superior Hideaway Rooms are slightly bigger than the Standard Hideaway Rooms in terms of square feet area. Each room is well-equipped with all the necessary amenities you will need for a comfortable, luxurious stay. 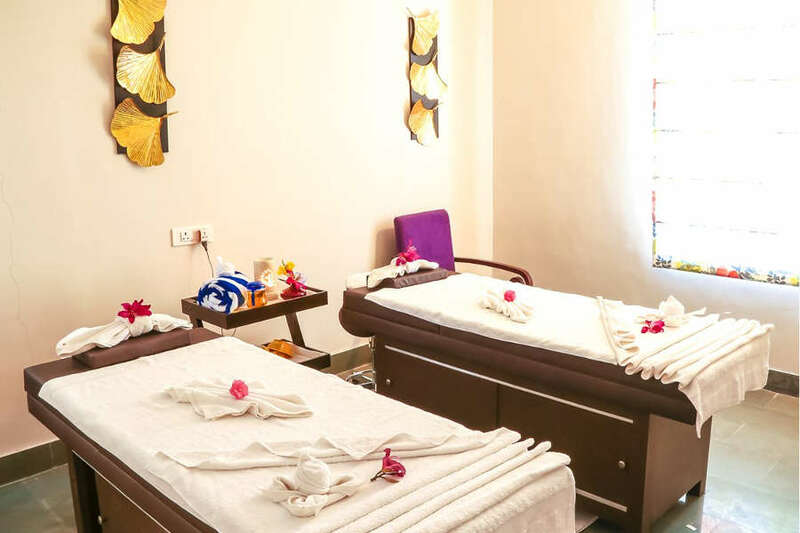 The rooms are spacious and tastefully furnished, and also feature a separate sitting area and a private sit-out with beautiful views of the Aravali Hills. 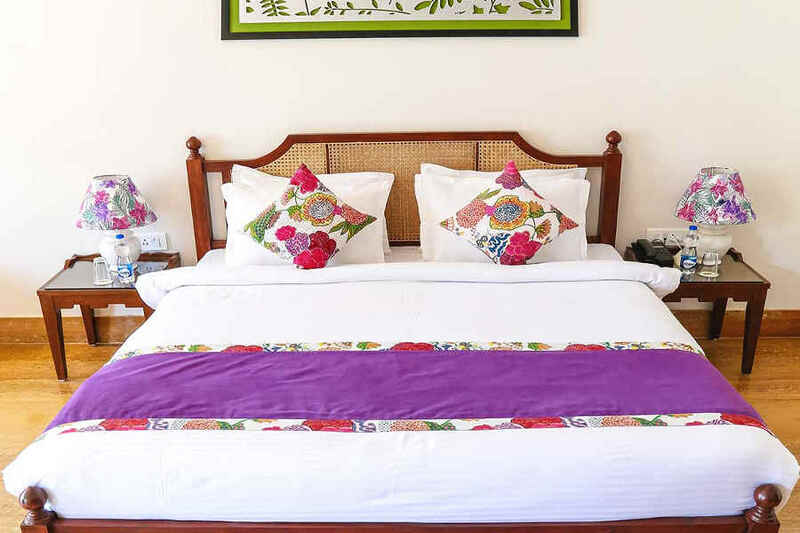 The cozy, well-appointed rooms work well with the calm and serene surroundings to let you experience a perfect getaway. Only one extra bed is allowed in a room. No charge for children below 3 years sharing the bed with the parents. Please let us know the age of children, if any, to avoid any inconvenience to you at a later stage. Any booking canceled 14 days prior to arrival will not charge any retention. After that will be charged 100% retention. 100% retention charges will be applicable in case of any cancellation or amendment or no-show received within 30 days of arrival. Transaction fee amount where applied for the payment made via payment gateway will not be refunded. Advance deposit will be required to guarantee the reservation. 1-night deposit required for bookings of 1 to 2 nights. Udaipur has a cornucopia of colorful attractions, both natural and man-made. You can visit the City Palace, Lake Pichola, Jag Mandir, Jagdish Temple, Fateh Sagar Lake, Saheliyon ki Bari Garden, Monsoon Palace, Gulab Bagh and Zoo, Ahar Cenotaphs, Vintage and Classic Car Museum, Bagore ki Haveli, Sahastra Bahu Temples, Karni Mata Temple, and Sajjan Garh Wildlife Sanctuary, among other popular tourist attractions. Fancy buying some colorful souvenirs? You will find them at Hathi Pol Bazaar. Should you wish, certain activities can also be arranged for you during your stay at the resort. These activities include an hour-long getaway to meet the community of the Bhil tribe, a short trek to explore the lush greenery of the Aravali Hills, a visit to the Eklingji Temple and Shri Nathdwara, and an experiential visit to a nearby village to learn more about the everyday life of the local villagers. If you have the time to spare, you can also teach children from the local village that the resort supports actively. A mountain bike can also be arranged for you should you wish to explore the surroundings of the resort on two wheels! Interested in cooking? You can visit the resort’s kitchen to learn a thing or two—the chef will be your assistant. Maharana Pratap Airport, located 14 km away, is the nearest airport from the property. Indira Gandhi International Airport in Delhi is located 647 km away. The railway station in Udaipur city is the closest railhead from the resort. It is served by trains to and from other cities in Rajasthan and across the country. 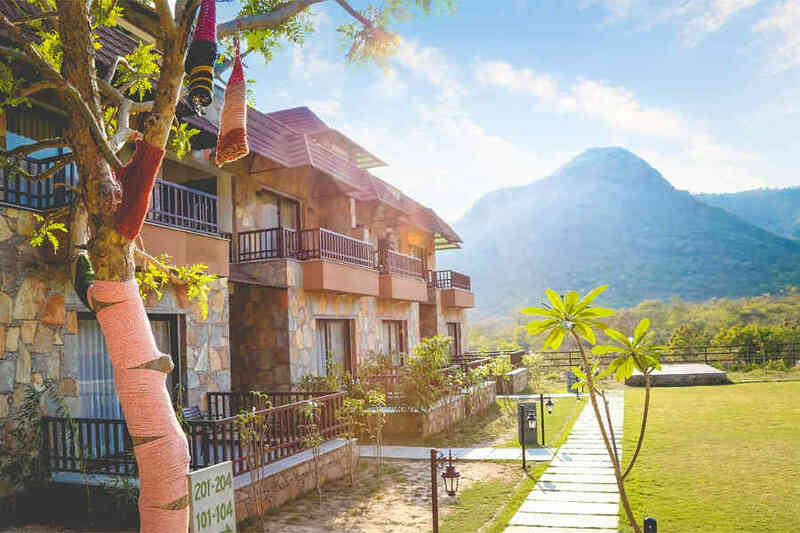 The resort is at a distance of 660 km from the New Delhi Railway Station. 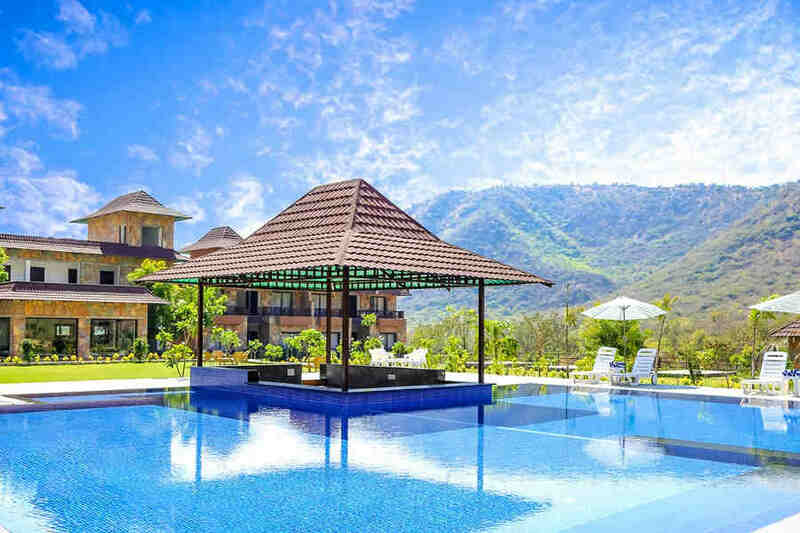 The resort in Udaipur is only a road trip away from many cities, including Ajmer (272 km), Indore (384 km), Jaipur (401 km), Delhi (666 km), Mumbai (766 km), Chandigarh (920 km), and among many other cities.